Delightful Designs by Danielle: Teacher Thank You! It's that time of year again when teacher cards & gifts are needed. With only one son left in Elementary school the number of teacher gifts/cards is minimal. Jacob's teacher loves coffee (who doesn't!!) so I bought a gift card loaded with caffeine! I always try to buy/make the teachers something that they will use and appreciate. The card design is pretty straight forward. I don't have any of the typical teacher type stamps so I went simple with my card and haven't used an image. The coffee stamps are from a Fiskars set and the sentiment on the tag is from Verve. Papers are all from my scrap pile (great way to use up those pesky scraps)!! 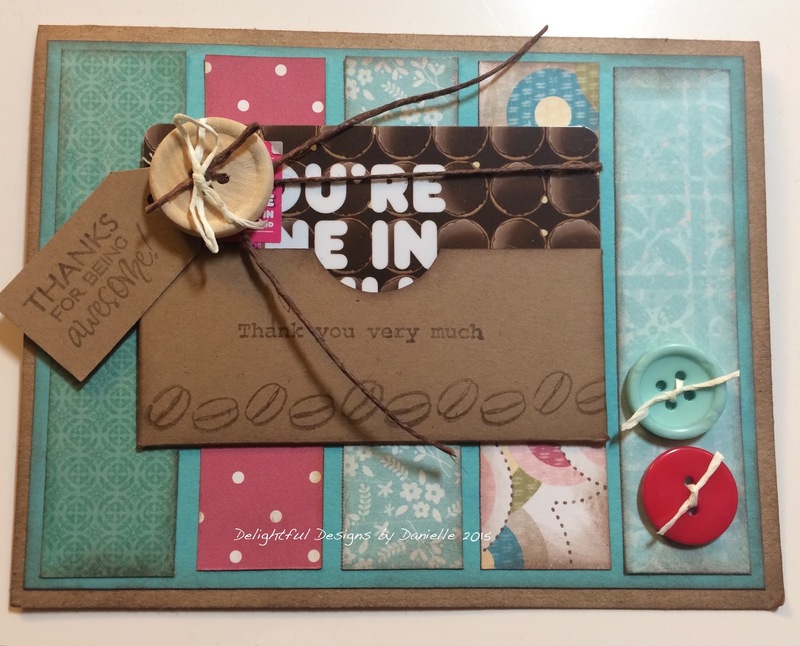 Buttons and twine finish off the card. I also inked up all the edges with some brown ink to add interest. I have a few more things to get done before we head up to Canada on Friday for a couple of weeks. The boys finish up school for the summer on Friday - good thing as they have already "checked out" and are ready for summer vacation to begin! That's all for today folks! Hope you have a fab day and thanks for stopping by - always appreciate your visits! Until next time ... happy crafting! That's a great idea for a teacher gift! Great Teacher card and gift. Thanks for joining us at Inspiration Destination. Hope to see you again and good luck! Beautiful card for a teacher (or anyone:). Thanks so much for sharing with us at Craft Your Passion!